The beauty of eCommerce is that all the marketing actions can be measured and improved daily, or at least weekly. But who does that? Isn’t too much hustle? Is Performance Marketing just a myth, or it’s something that can be done fast and easy? We met entrepreneurs that started an online shop to test the market and see how things will evolve. They didn’t have technical skills, or online marketing experience, but that didn’t stop them to sell online. That is the entrepreneurial way and we know it. The problem is that they stared working with marketers and agencies that were not transparent and didn’t help them to understand their performance. After some months of collaboration, the entrepreneurs realised they don’t know exactly what are they paying for and how they can improve their actions. When we talked with them we asked about some simple KPI’s like conversion rate (CR), cost per acquisition (CPA), average order value (AOV). All they know is that they had traffic and some sales. We believe that this is not a good way of doing eCommerce or Marketing. 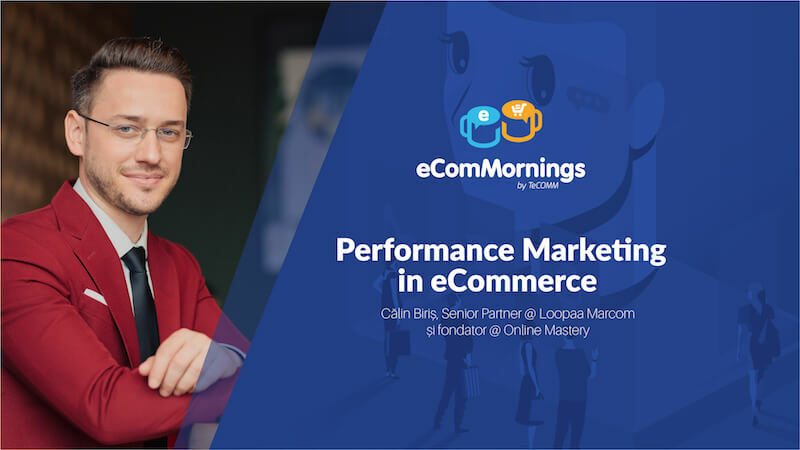 If you agree and want to understand the Performance Marketing way and how you should work with your marketing team or agency, we invite you to the eComMorning event organised together with TeCOMM and ClujHub. If you are the owner of an online shop, or if you are a Marketing Manager for an eCommerce business, join us this Thursday at 9 AM at ClujHub, in the city center of Cluj-Napoca, for 3 hours of Performance Marketing talks and networking. The coffee is offered by Meron and is on the house. Register here for free.